Today (9 March), large numbers of nurses from Delhi & NCR hospitals gathered under the banner of Nurses Welfare Association and Centre for Struggling Women (CSW) to celebrate International Women’s Day. The meeting was called to discuss problems such as lack of safety for women nurses, strenuous work schedules due to poor nurse to patient ratios, pay disparity between private hospital and government hospital nurses, etc. The nurses decided to use the historic occasion of International Women’s Day to come together, especially due to growing concerns regarding rising incidents of sexual violence on women in the city. The meeting commenced with two prominent panelists, Dr Mary John (Professor of Economics, J.N.U.) and Dr Bijayalaxmi Nanda (Asst. Professor, Miranda House, D.U. ), addressing issues like gender discrimination in workplaces. 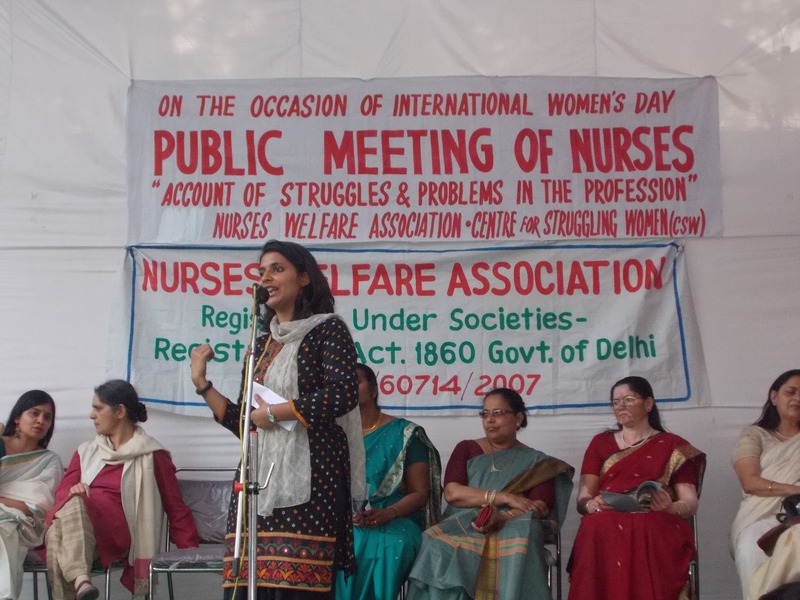 Other speakers like Mrs. Krishnakumar from the Nurses Welfare Association encouraged the nurses to voice their concerns about harassment and exploitation at workplaces. Maya John from the woman’s organization, Centre for Struggling Women, emphasized that for sexual violence and discrimination to come to an end it was necessary for greater numbers of women to enter public spaces, and hence, for greater employment generation. She argued that such enhanced participation of women in the workforce would effectively challenge existing discrimination in workplaces. Anxious about the daily risks they face while commuting to work as well as when at work in hospitals, women nurses discussed how existing laws regulating workplaces need to be re-assessed. Many of the nurses complained of harassment by patients’ visitors, as well as male hospital staffers. However, they felt that such sexual harassment was made worse by the fact that most of them were in highly exploitative work contracts. Many nurses, for example, expressed how growing contractualization of work was forcing them into more vulnerable conditions. They discussed how the lack of government hospitals was compelling most nurses to enter contract jobs in private hospitals/clinics where salaries were low and on an average ranged from just Rs. 5000-10000 rupees per month. Moreover, the simple fact that many private hospitals force their nursing staff to work extra shifts, do overtime, etc. and do not at the same time provide for something as basic as transportation to their women employees, is indicative of the conscious ways in which hospital managements’ are putting their women work force at continuous risk. Similarly, by not providing on-campus accommodation to their nursing staff, most hospitals were compelling nurses to commute unsafe distances after their evening shift. Many nurses employed across Delhi-NCR hospitals also complained that hospital bouncers are often used to physically and verbally intimidate nurses who speak out about unsafe and exploitative work conditions. The nurses also highlighted how the local administration and local police stations have proved to be very lax in their response to complaints made by nurses about sexual harassment, stalking, and even complaints concerning the use of bouncers by hospital managements during nurses’ strikes. In this light, the nurses discussed and passed a resolution/demand charter. This charter included demands like pressing the Government to constitute a wage board for the health sector, to create more government funded nursing colleges and government hospitals, and to properly regulate work conditions in hospitals, i.e. by conducting regular safety audits. According to the nurses, the safety audits would help regulate: (i) work hours/shifts given; (ii) whether a safe atmosphere exists in and around hospitals; (iii) whether the recent Supreme Court ruling against the bond system (i.e. surrender of original certificates to the hospital management for the period of contract) is being followed in all hospitals and nursing homes; (iv) whether written work contracts are being provided to all employees; etc. The nurses believe that it is through such regular safety audits that the Government can assess whether such essential work conditions exist in workplaces or not. Moreover, in the light of how unregulated private transportation is in the Delhi-NCR region, the nurses also resolved to petition the Government to make it mandatory for all hospitals to provide transportation to their staff. In addition to this, it was also felt that a better managed and more accountable public transport had to be introduced by the Government in order to replace various modes of unregulated private transport—a measure which will go a long way in ensuring safety of women commuters. Lastly, the issue of regulating the functioning of police stations was also raised in the meeting. After many nurses recounted their experiences at local thanas where their complaints were not entertained, the gathering of nurses decided to press for some concrete action on this front. The nurses felt that lodging of FIRs and placing of police stations under CCTV surveillance in order to encourage prompt police action, has become a non-negotiable demand. The fact that many women, including those who face sexual harassment at home or in workplaces, are still afraid to file complaints with the Police, or, have been turned away by police stations, is a serious problem that the nurses will address collectively, and raise with the concerned authorities. Mandatory consultation with nursing representatives while formulating work-related provisions such as shift-timing, dress code, etc. This is essential so as to prevent practices like assigning night duty to a single female—a practice which often exposes the lone nurse to harassment by ward-boys, other male staff, etc. Make the nationwide general strike on 20, 21 February a success through your own initiatives! Central Trade Unions have called for a countrywide general strike on 20-21 February. Workers from all central institutions and industries like Banking, Coal, Transportation, Postal, Shipping, Ordinance (Defense), Steel will observe this two-day all India level strike by organizing rallies against anti-worker policies of the government. Unions have demanded that the price-hikes should be controlled and concrete measures should be taken towards employment generation, contract workers should get wages and benefits equal to permanent workers, every citizen should get pension, and minimum wages should be at least Rs 10,000 per month. We support these demands of the unions and appeal to the workers and common masses to give the strike a massive support. However, we would like to underline the fact that there is an established opinion among union leaders and workers that a general strike of unionized workers in the organized sectors is enough to ensure a 100% success of the strike. But is this understanding correct? Without the participation of millions of unorganized workers (those who are not members of unions) in our struggle, in our movement and in our strikes, can our movement attain its aims and objectives? We the workers should give serious thoughts to this question. Last year on Feb 28 there was another one-day countrywide strike on the call of the unions. What did we achieve from that strike? There was a hope among union leadership that the strike would pressurize the government to agree to bring the unions to table to discuss their demands, but this hope proved to be false. Whether the government is that of UPA or of NDA, or of any party or alliance, Indian government itself is a big capitalist, an investor. Indian government is itself selling capital to foreign capitalists by taking it out from the public industries, for investing in other countries for more profit. In this situation, for unions to think that workers’ interests would be protected if their mother parties form or join the government is very distant from the reality. Today throughout the globe the slowdown of capitalist production and distribution has plunged the system into a deep crisis because of its own contradictions. The efforts of the G-8 and G-20 countries to come out of this crisis have taken the forms of new economic policies, new labour policies that establish contract system, outsourcing, foreign investment, divestment, privatisation, multinationalisation etc. Capitalist governments everywhere are indulging in deception, fraudulent practices and measures in order to provide oxygen to their respective economies. In this situation, to differentiate between the American and Indian governments and support the latter is purely a bourgeois point of view. In the same manner to differentiate between foreign capital and national capital and take the side of national capital against foreign capital is anti-working class since the colour& character of both the foreign as well as national capital is same—to exploit workers in every possible way. On the contrary, we must adopt a working class position and advance on the basis of a long-term working class understanding. Today to say that the working class should follow the ideals of Gandhi, Vivekananda or other saints (as some unions have said this in their leaflets) will amount to a gross neglect of the specificities of the changed reality. Could anyone have imagined 100 years back that India would attain such a high level of production, which it has attained through the capitalist mode of production? What did we achieve from the 28 Feb 2012 strike? If nothing, then why not? How are we being deprived of even the minimum that we had? Are the tactics that we are adopting to regain them correct? What are the new means that need to be invented to attain our objectives? There is a growing need to give priority to a discussion on these questions. Today, union leaders are formulating our demands and calling for strikes. When we formulate our own demands in a collective manner and take our own measures to attain them, then whether the strikes will be for one or two days or indefinite will not be decided beforehand. Then our struggle and movement will not be limited to slogan shouting at factory gates or street-corners. Then our struggle would generate a massive workers unity, long-term movements and revolutionary organisations. The beginning to “Take your own initiatives – be organised – implement on your own” must be made at our own workplaces – we will have to start thinking of struggles and movements on the basis of our self-activities on the everyday questions. As long as we accept the present relationship between capital and labour, we will have to deal with the problems generated by their contradictions. More and more exploitation, attacks on workers to gain profits – all these are necessary for capital, they are its compulsions. Capitalist production process has itself arrived at its final stage. Worldwide depression, inflation, unemployment, outsourcing, contractualisation, increase in the amount of work, increase in the working hours, shutdown of the newer companies before they could attain their maximum capacity are all symptoms of a moribund capitalism. In order to save ourselves from destructive wars, to save environment, humanity and all other species it has become extremely necessary to remove this inhuman capitalist production system by establishing a collective production-distribution system or socialism that is based on associative collectivity of workers-producers – their control and management. Present organisations and unions are associated with political parties who are entrenched within the capitalist parliamentary system. These organisations and unions do talk about workers but they are ever ready to establish secured positions for the leaders in the present society and within their own organisations – they reproduce the distance between leaders and general workers. The unity among today’s unions and organisations are enforced from above, and thus are unstable and illusory. On the other hand, struggles and movements initiated by workers themselves would generate workers organisations (factory committees, workers councils etc) promoting a true unity with a commitment towards revolutionary transformation. A strong, long-term unity is possible only on the initiatives of the workers themselves. The capitalist class in India has achieved two goals in the general interest of capital by implementing the new economic policy. By employing cheap contractual labour in place of permanent workers, they have, on the one hand, subsidised the production cost, and on the other, they have intensified intra-class competition and discrimination on the basis of permanent and temporary categories. Permanent workers look down upon temporary contract workers instead of recognising them as equals, thus fragmenting the workers unity. Hence, in order to intensify the struggle against their exploitation and oppression by capital through their own initiatives, establishment of a unity between permanent and temporary workers is extremely necessary. In this regard, permanent workers will have to take the initiative. 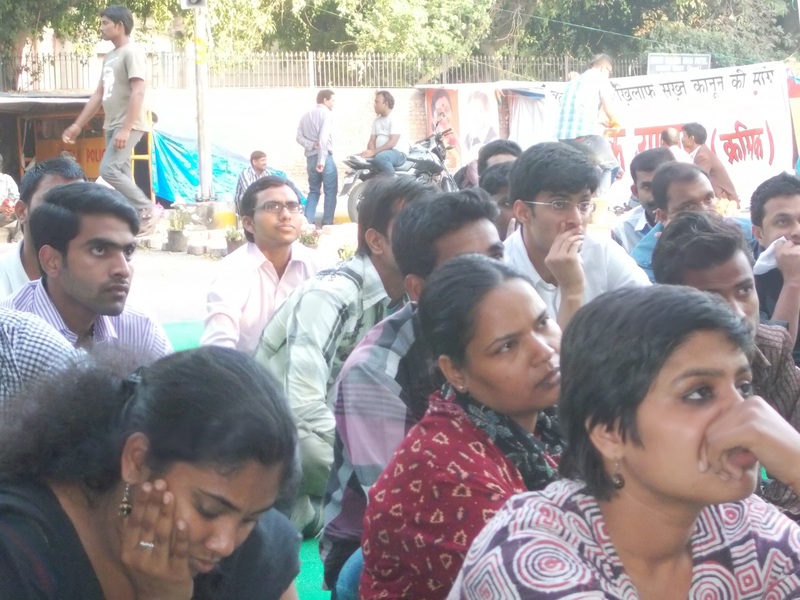 In 2011-12, workers of Maruti Suzuki Manesar led a heroic struggle on the basis of such unity between permanent and temporary workers and despite an intensive crackdown by the management, government and police on the workers after the July 18 incident the struggle is still on – on the basis of this unity. Learning from the struggle of Maruti Suzuki workers, during the upcoming Feb 20-21 strike, let us build workers committees uniting workers across all segmentations and divisions – permanent-temporary, men-women etc. Let us build our struggle on our own initiatives on the principle of “Do not demand, but implement’, and continue it even after the strike! Only then we will be able to pressure the government and the capitalist class to concede. Only by a continuous struggle based on our own initiatives beyond any ritualistic confines can we make this two-day strike successful. As you are well aware, we workers in Maruti Suzuki India Ltd., Manesar, Gurgaon are waging a struggle against the exploitation and injustice heaped on us by the company management, state administration and the government. Our only crime has been that we have dared to raise our voice for the demand of formation of Union and against the illegal practice of contract workers system. Since 18th July 2012, after the unfortunate incident in the factory premises as part of a management-woven conspiracy, we workers have been continually facing the brunt of repression. The company-management has at once terminated the jobs of over 1500 contract workers along with 546 permanent workers. They have, with the help of the state administration, heaped fabricated cases ranging from arson to murder on 211 of our fellow workers, while 149 workers, including our entire Union leadership, continue to languish in Jail for the last 6 months. Keeping aside all legality, workers and our families have continuously faced brute police atrocities. We have chosen the path of struggle against this repression and injustice. In the past 6 months, even when faced with various state administrative blockades and repression, our spirits are unfazed and our movement is raging on. One of the reasons that we are able to sustain this struggle is also the solidarity and support that we have continued to receive from various workers organisations-trade unions and pro-people forces. But to take the struggle forward, we require more support and solidarity from your side. In this stage of the struggle, we have decided that on 5th February 2013, Tuesday, there be a all-India day of solidarity action, demonstrations in our support and on that day itself, a memorandum also be sent addressed to Chief Minister of Haryana. We not only hope but trust that we will get your full solidarity once again. Against the nexus of company-management and state power, the protest of our pro-justice and class unity shall reach the deaf ears of those in power. Office: Room No. 45, 4th floor, Civil Sectt., Chandigarh, Haryana. As one month passed since the young physiotherapist was brutally raped in Delhi while traveling in a private chartered bus, working women who are frequently at risk on Delhi’s roads as well as in their workplaces, have been consciously raising the issue of how much more needs to be done to ensure safe and conducive work atmosphere for women. Nurses from across big hospitals in Delhi such as AIIMS (Delhi) held a peaceful protest rally in order to keep alive the issue of safety for women. Anxious about the daily risks they face while commuting to work as well as when at work in hospitals, women nurses strongly believe that existing laws regulating workplaces need to be re-assessed. Many of these nurses complain of harassment by patients’ visitors, as well as male hospital staffers. However, they felt that such sexual harassment was made worse by the fact that most of them were in highly exploitative work contracts. The simple fact that many private hospitals force their nursing staff to work extra shifts, do overtime, etc. and do not at the same time provide for something as basic as transportation to their women employees, is indicative of the conscious ways in which hospital managements’ are putting their women work force at continuous risk. Many nurses employed across Delhi-NCR hospitals also complain that hospital bouncers are often used to physically and verbally intimidate nurses who speak out about unsafe and exploitative work conditions. In recent strikes in hospitals like Asian Institute of Medical Sciences (Faridabad) and Sharda Hospital (G. Noida), such private (male) security guards entered the nurses’ hostel attached to the hospital and physically threatened many nurses who were on strike. In such cases, the local administration and local police station have proved to be very lax in their response and are, more often than not, seen washing their hands off dangerous situations where the safety of working women is constantly at risk. In this light, nurses and other working women are pressing the Government to properly regulate, or basically, to conduct a regular safety audit of workplaces across the city. Regulation of work hours/shifts given, creation of a safe atmosphere in and around the workplace, provision of written work contracts for all (even contractual and daily-wage) employees including women etc., are the need of the hour. It is through regular safety audits that the Government can assess whether such essential work conditions exist in workplaces or not. Moreover, in the light of how unregulated private transportation is in the Delhi-NCR region, working women across the city strongly feel that it should be made mandatory for all employers (private offices, hospitals, factories, etc.) and not just for owners of call centres to provide company transport. It is also necessary that better managed and more accountable public transport is brought in so as to replace various modes of private transport—a measure which will go a long way in ensuring safety of women commuters. Lastly, the issue of regulating the functioning of police stations is also of major concern to women across the city. It is necessary that lodging of FIRs and placing of police stations under CCTV surveillance becomes a non-negotiable demand. It is extremely troubling that many women (including those who face sexual harassment at home and/or workplaces on a daily basis) are still afraid to file complaints with the Police, or have been turned away by police stations. Such negligence is a serious problem that has to be addressed immediately.